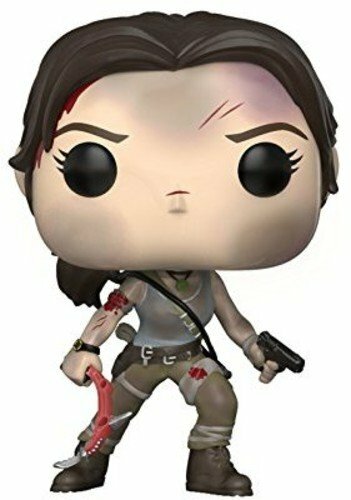 Crystal Dynamics have promised that their latest game, Rise of the Tomb Raider, will push Lara Croft to her physical and mental limits as she journeys across Syria and Siberia in search of the secrets of immortality. Not only will she need to rely on her wits and outdoor survival skills to accomplish her mission, she will also need to rely on some of the skills she may have acquired during her student days. Creative Director Noah Hughes has confirmed that GPS caches, diary entries, and collectible relics will once again be present in Rise and will add depth to the game’s narrative and lore much like they did in the 2013 game. But he also pointed out that Lara will now be able to learn new languages and, with practice, will be able to decipher ancient texts. 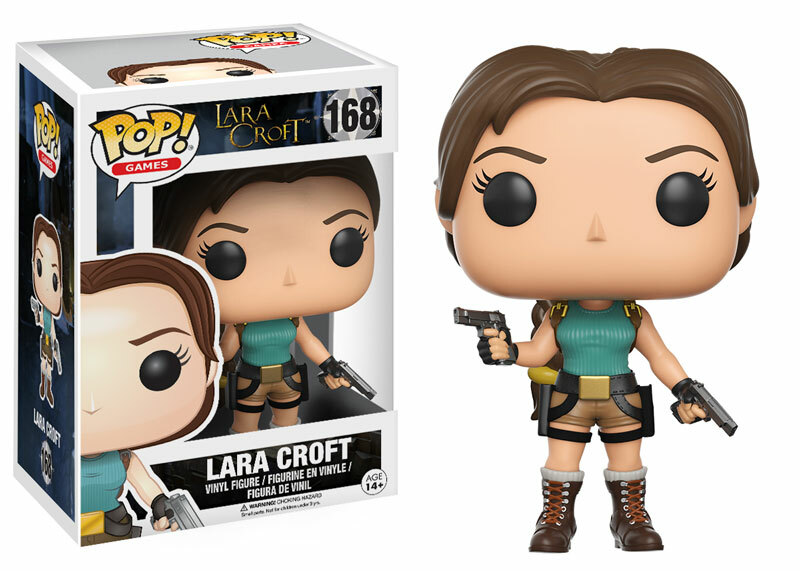 Language proficiency will be treated like an acquirable skill and gamers will need to collect fragments of ancient scripts so that Lara can gain “language XP” and slowly learn how to decipher the inscriptions she comes across. This skill was first mentioned in the Game Informer and Official Xbox Magazine features published earlier this year and was demonstrated in the Syria demo that has so far only been seen by the press and the E3 community ambassadors. 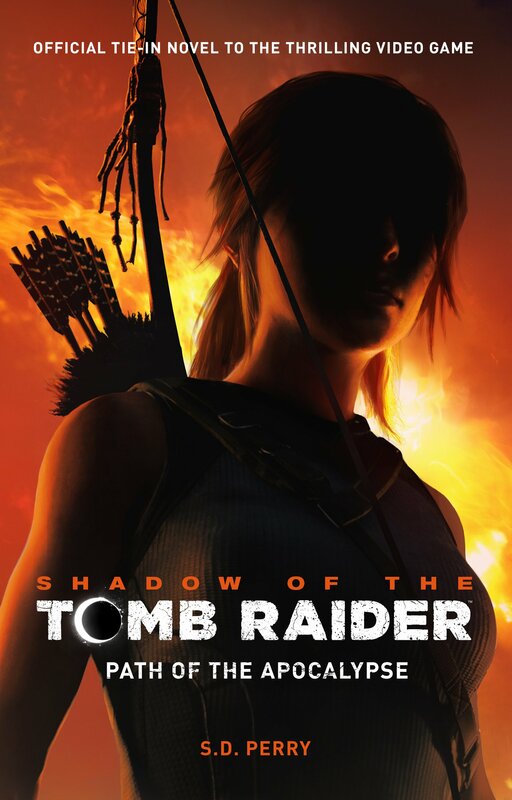 In this press-only demo, Lara stumbles upon a monolith but is initially unable to decipher the inscriptions carved into it. By examining the murals within the tomb, she gains language XP and, in doing so, learns how to read the aforementioned inscriptions. 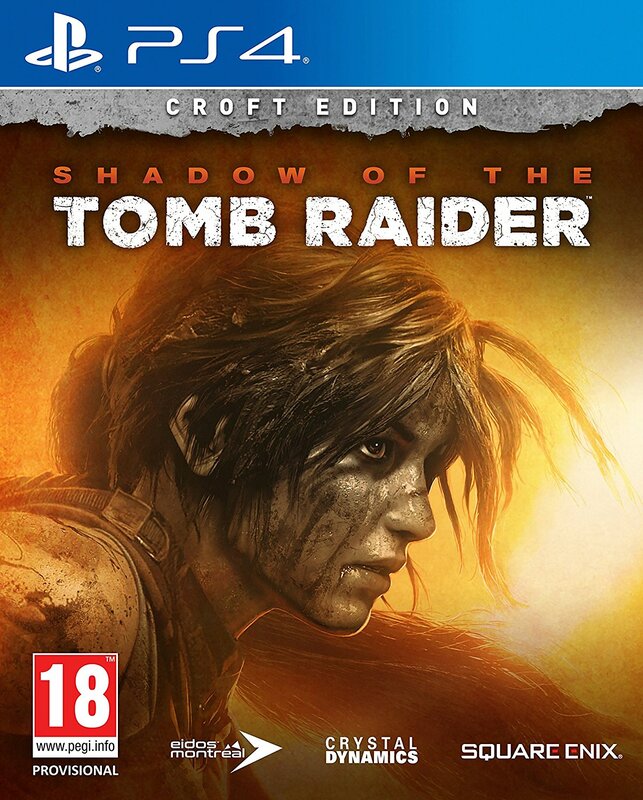 This monolith (and perhaps others like it) will act as a sort of treasure map, unlocking ancient secrets (and tombs) and inspiring a sense of discovery in the gamer as Lara hones her language skills. 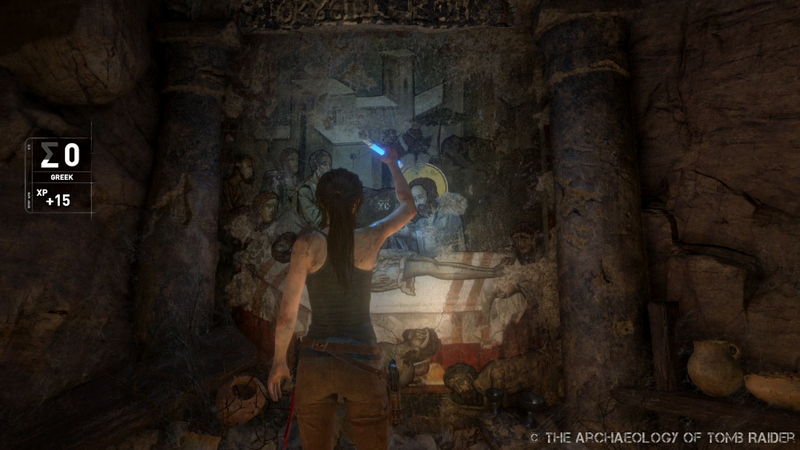 From the Game Informer article, it’s clear that Mongolian is one of the ancient languages Lara will tackle but Brandon of TombRaiderHQ noted in his first impressions article that he spotted a “Greek progress badge” during his viewing of the Syria demo. Could the Greek inscription in that Syrian tomb point the way to the Ancient Greek trireme seen in the closing scene of the “Siberian Wilderness” demo? In his interview with Game Informer, Hughes did mention that “Lara will pass the remains of dozens of previous explorers” and that “the Mongols weren’t the only people to search for the lost city of Kitezh“. So Lara’s new-found linguistic skills may very well shed some light on the adventurers and conquering armies that came before her. If you’d like to build up your own language XP and learn an ancient language, check out my articles 10 Fantastic Free Resources for Learning Egyptian Hieroglyphs and 5 Fantastic Free Resources for Learning Maya Glyphs. If Egyptian and/or Maya glyphs aren’t your cup of tea, you can find a wide selection of online language learning resources over at Lexicity. Or you can take a page out of Lara’s book and learn some Classical Mongolian over at Lingua Mongolia. When I see languages in games, a part of me wants Cypher Puzzles like you find in several point & click adventures games. But I suppose they’re not the right fit for Rise. I like the idea of the unlockable skill. The LXP will encourage exploration, which is always nice and something his game seems to be going for. Hopefully most of it will be optional, otherwise giving out the XP becomes a bit pointless and should just be a story-unlockable skill. To respond to an above comment. I would hope the artefacts to tie into this language skill, and that they would all add more depth to the story, at least as backstory to the different locations, you know? Would be awesome if they translated into legends and stories that foreshadow events. Would seriously mess with people’s heads hahaha. Actually, language learning isn’t part of most archaeologists’ training unless they specialize in Classical Archaeology (where Ancient Greek and Latin are a must) or Egyptology. Many archaeologists do learn languages as part of their degrees but I think it’s mostly an optional extra rather than an essential part of their degree programme. Just to give an example, here’s the course structure for a BA in Archaeology at UCL (the university Lara went to according to the reboot timeline) – http://www.ucl.ac.uk/archaeology/studying/undergraduate/degrees/ba_bsc_archaeology/structure (no real language element but I imagine a student could study a language or two as part of those “free option” blocks if they wished). Actually, It makes perfect sense. 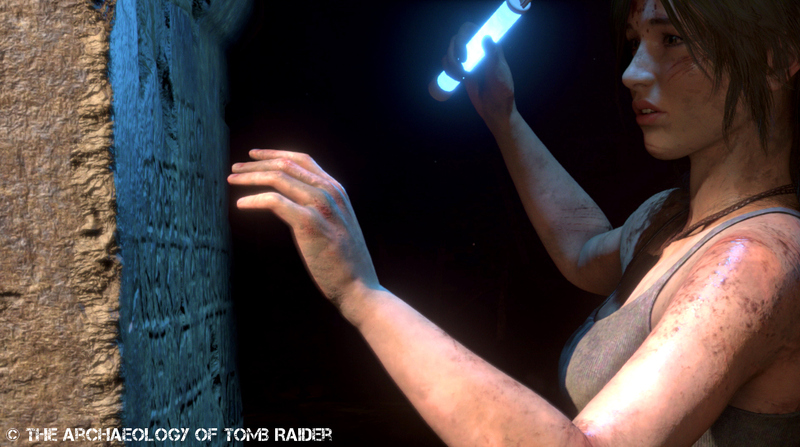 Even if Lara learned these languages before, reading ancient inscriptions is not like reading a modern book. One requires a lot of training in order to decipher the signs used in the inscriptions, and this is obtained by many hours of practical work. It is not the same, for example, to read Greek from the edition of a text, in nice printed characters, as reading from a directly from a papyrus. I have been working on Demotic papyrology or five years, and every time that I start working on a new text, it takes me some time to get used to the hand of the scribe, its palaeographical particularities, dialectal features of the language, etc. Therefore, it makes perfect sense that Lara may improve her linguistic (and palaeographic/epigraphic) skills as she gets more used to the type of inscriptions she will find in her adventures. Also, whoever works on linguistic stuff knows how rusty one can get from not reading in a particular language for a while! As for BA programs in Archaeology, if one decides to specialize in a particular area, the knowledge of the language/s and script/s used by the peoples in it is fundamental. This can be acquired in master’s programs later, but if one is really interested and serious about the object of her/his study, will do whatever it takes to get that knowledge, even if that means studying it on their own. Plus, prestigious MA/PhD programs will consider this as a very positive trait of the student when deciding on admissions. Sorry for the typos, the comment was sent before I could re-read it (technology hates me). I wonder, though, whether deciphering the monolith will be optional or whether it’s central to the main narrative of the game. It’d be great if it were optional as it would give gamers some incentive to really examine Lara’s surroundings…but I’d also be happy if it were mandatory. I’m also curious to see how the relic viewer from TR 2013 will be used in this game. Will the relics actually add something to the plot (or side plots) or will they just be random things that add nothing of real value to the game. Assassin’s Creed did a great job of providing detailed historical backgrounds and trivia for most of the artefacts and places Kenway encounters. 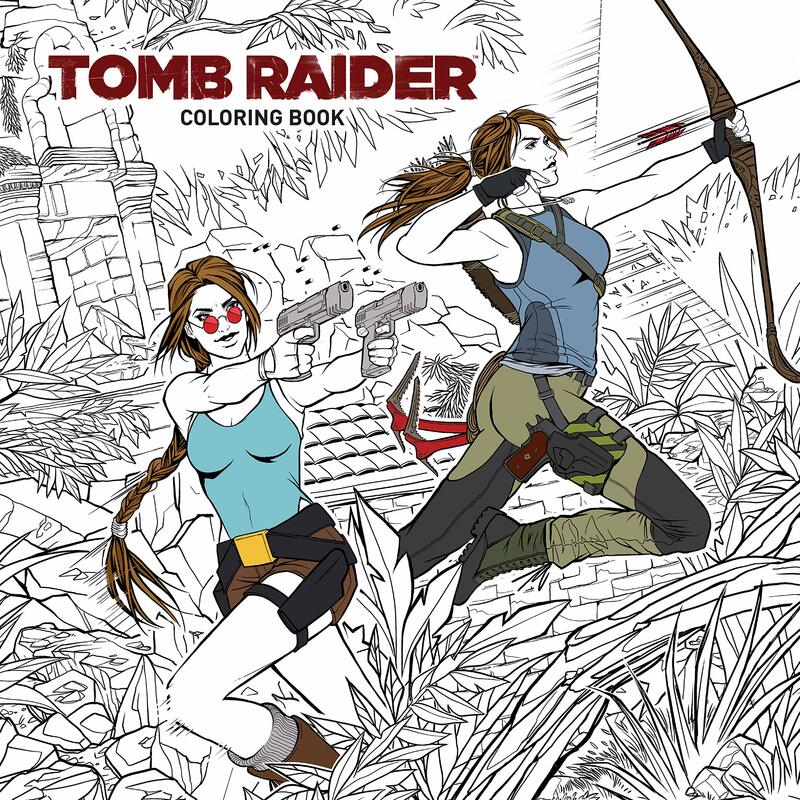 I’d love it if Crystal Dynamics does something similar for Rise.